The ridiculousness of “gender” studies degrees has been rightly mocked before, especially when they holders of those degrees can’t get a real job. This mockery readily extends to the various racial and LGBTQ studies programs, as well as the various “critical theory” courses of studies. The mockery on the internet included asking if the expected jobs included “patriarchy investigator,” a “professional privilege checker,” or a “victim complex denial specialist.” It turns out that these lunatics actually believe in getting jobs just like that! 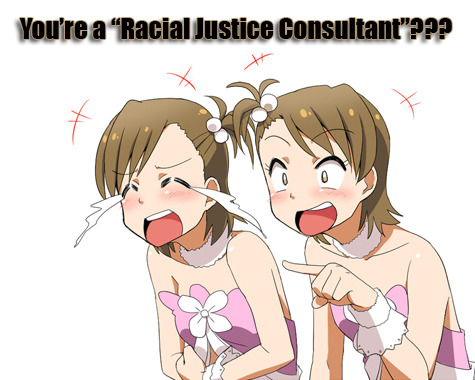 Further, just a “Racial Justice Consultant” may not be enough, and sometimes also “a consultant for the intense sexism on which the entire plot-line is predicated on, or a Misogyny Consultant”. Yes, there really are such people who believe that there is a glorious career in enforcing Progressive norms. The only way to respond to something that is beyond any and all parody is simply to laugh at them. Hat Tip: Charles C. W. Cooke. This entry was posted in Progressives and tagged FAIL, Gender, Kyriarchy, Social Justice. Bookmark the permalink.